Salt is one of the most used seasonings in the world, yet most people don’t even realize there are many kinds of salt. The salt most people are familiar with is the simple table salt. Finely ground, iodine added, it is meant to be used as a table seasoning, not for cooking. The iodine adds a bitter flavor that most recipes don’t need. This salt is commonly mined from the ground. We will leave the concept of table salt behind for this discussion. 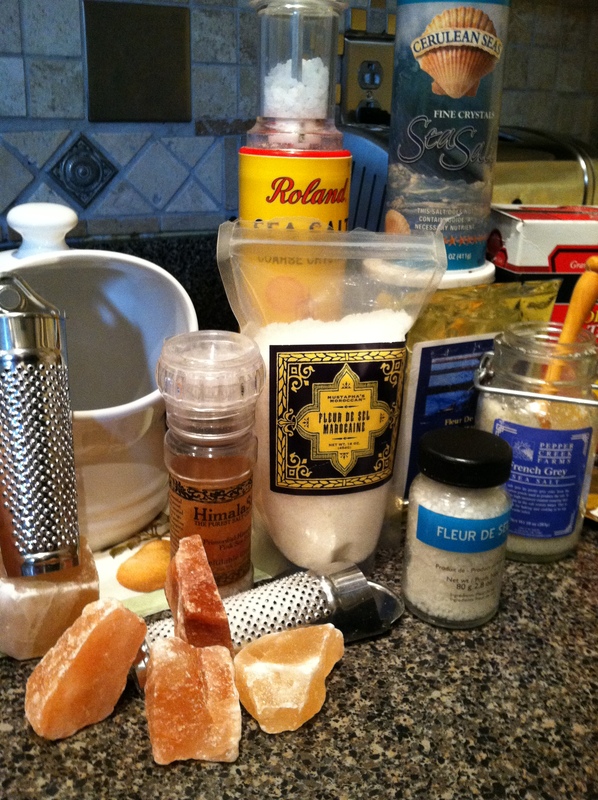 My favorite salt for finishing dishes is French Fleur de Sel from the coast of Brittany. It adds a delightful crunch to anything from crisp fresh radishes to scallions and baked potatoes. Its appearance is slightly off pure white and has the appearance of being slightly damp. Being a damp salt, it does not dissolve as quickly as a drier salt would. This is why it is used as a finishing salt. The irregular size of the crystals contributes to different melting times thereby lending a salting flavor on many different levels. Here’s a link by one of the worlds foremost experts on salt, Mark Bitterman. He has authored “Salted: A Manifesto on the World’s Most Essential Mineral, with Recipes” available on Amazon. Face it, you won’t be salting your pasta water with Fleur de Sel so go ahead and splurge on some. Personally, I like to sprinkle the top of chocolate chip cookies with Fleur de Sel before they go into the oven. As my hair stylist would say,”OMG!”. French grey salt is similar to Fleur de Sel and is used the same way. It gets the grey from being harvested deeper than just the very top like Fleur de Sel. Still on the pricy side, but should not cost quite as much as Fleur de Sel. Sea salts are ocean sourced and are dried. You can find crystal sizes from coarse to fine. As an inexpensive salt, it can be used in any application. Mined salts are cut from the earth. One of the largest salt mines is in Pakistan. From this mine you find Himalayan rock salt which is pink in color from the iron oxide content. Shades vary from light pink to dark reddish hues. Being very hard, the salt can be found shaped into trays, platters, bowls, cooking slabs, lamps, and candle holders in addition to being finely ground for kitchen use. You can use the smaller fragments in a salt grinder just as you would a pepper grinder or use a rasp like a nutmeg rasp or a micro-plane. I like this salt on popcorn. Serving food on the slabs is quite interesting. The moist foods will become lightly salted and dry foods do not pick up salt flavors at all. Salt is not fat soluble so if you oil the slab or serve fatty foods on it they will not pick up large amounts of salt thereby over-salting the food. If using the slabs for cooking, the slab must get to 600 degrees Fahrenheit so the juices evaporate rather than hanging around melting the salt slab and over-salting the food. Heat the slab slowly. The salt slab will become translucent as it heats. Salt bowls? I’m thinking ice cream! If you use a smoker, wrap some coarse crystals of sea salt in multiple layers of cheese cloth or muslin and place it in the smoker. You will get a greyish smoked salt as a result. The trace of smoke flavor is really nice on a piece of fish. The intention of this post is to simply increase your awareness of salt. 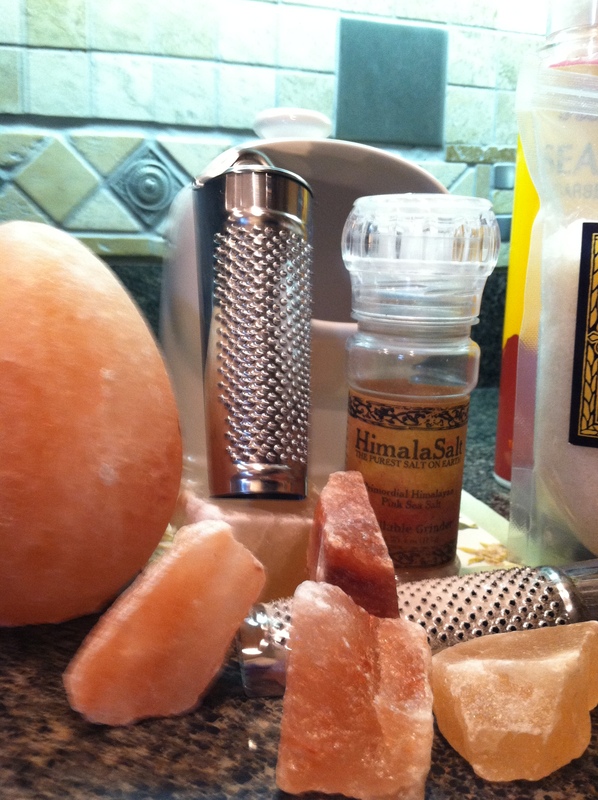 If you explore the subject, you will find there are some amazing salt products out there. Try some. Expanding your salt repertoire can be fun. Keep your special salts for finishing dishes. Kosher salt is the staple salt I keep in the kitchen. Great for pasta water, and general all around seasoning. It’s not expensive and available everywhere. Use this salt to create your own seasoning salts. 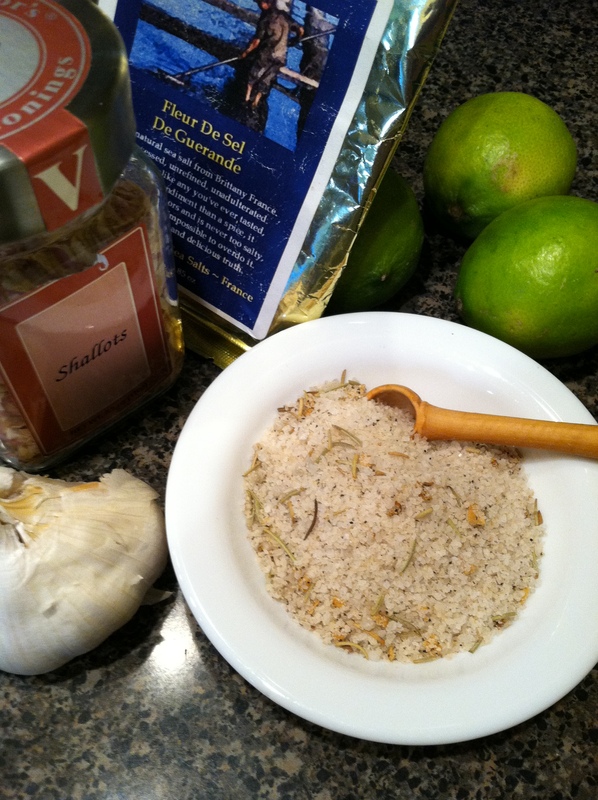 Combine herbs, spices, garlic, onion to create your own special blend. Use a knife or a spice grinder to finely chop the herbs and flavorings you choose. Combine the mix with kosher salt; stir so it gets all mixed up. Store in glass jars or plastic containers. Use it for finishing vegetables, pasta, potatoes, to season whatever you cook instead of plain salt. Typically, kosher salt as that is what I have on hand. However you can use whatever kind of salt you want- just don’t use iodized table salt. If you have health concerns and don’t use salt, get in the habit of using herbs, spices and citrus zest to enhance the flavors of your food. More about that in another post. Explore something new, have fun and happy cooking!